Back in March, Far Out Awards was contacted by a friendly customer who went by the name of “Buddah.” Buddah was looking for a customized Pizza Champion Trophy Cup featuring a simple slice of cheese pizza topped with two of our hottest red hot chili peppers. It was immediately clear Buddah had one hot event planned and I wanted to know more. The contest rules were simple, the first competitor to complete the Grimaldi’s pizza pie or eat the most within the 7 minute time limit will be declared the winner. When I watched Buddah’s video footage of the event I quickly realized that although the rules were fairly simple, the physical challenge was not. The cameraman pans back and forth between teary-eyed, red-faced competitors as Buddah counts down the time with his Far Out Award in hand. As the crowd collectively counts down from 10, a seemingly unfazed gentleman dressed in flannel shoves whatever remaining crust he has left in his mouth, finishing his entire pie just in the nick of time. That man was John Krasnow of North Carolina, a last minute entry to the Fiery Pizza challenge. As Krasnow waits for his volcanic pizza trophy the cameraman asks him “on a scale of one to Mount Vesuvius, how are you feeling?” To which John unequivocally replied “Vesuvius.” I think John’s answer serves as a testament to the success of Buddah’s first event in the New York City Hot Sauce Expo. Congratulations John and Buddah, we can’t wait to see what you have in store for next year! 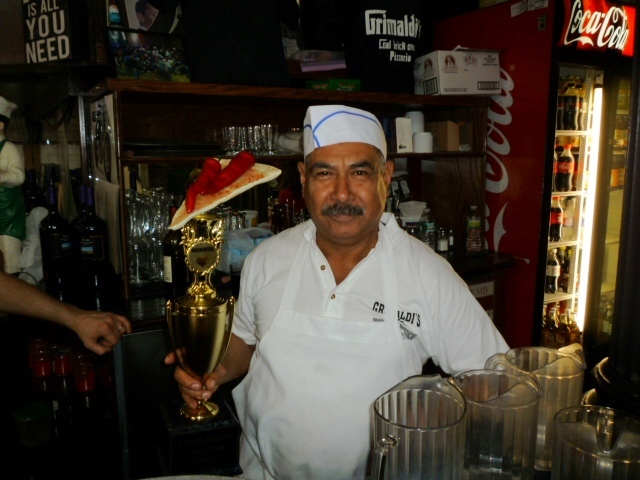 The Chef of world famous Grimaldi’s Pizzeria in Brooklyn holding the Volcanic Peppers’ Fiery Pizza trophy prior to the event. 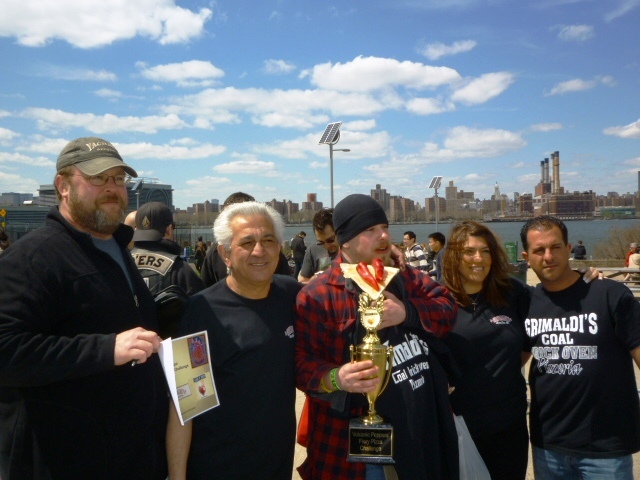 John Krasnow, the winner of the Volcanic Peppers’ Fiery Pizza Challenge, with the crew from Grimaldi’s and his Far Out Awards Pizza Trophy.